From 1.01 Pilot until 5.07 The Curious Case of Dean Winchester, Dean always wore a bracelet on his right wrist, with few exceptions. 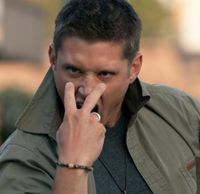 In season 1, he wore an elephant hair – style bracelet. Based on mythology, this brought good luck and protection from harm and illness. The bracelet is missing in season 2 (2.01 In My Time of Dying, 2.02 Everybody Loves a Clown, 2.03 Bloodlust), and it's likely it was lost or broken in the car crash at the end of season 1. 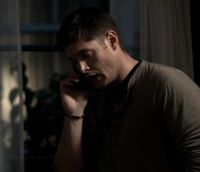 Dean talks to Lucas in 1.03 Dead in the Water. 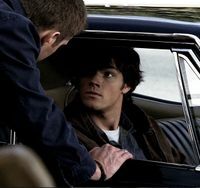 Dean & Sam in 1.06 Skin. 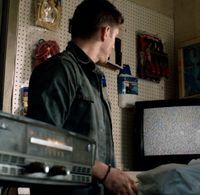 Dean doing research in 1.07 Hook Man. Dean & more research in 1.11 Scarecrow. Dean's Bracelet in 1.21 Salvation. 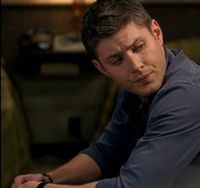 Dean as he interrogates Meg in 1.22 Devil's Trap. 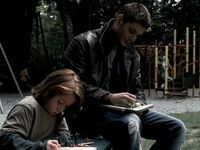 From 2.04 Children Shouldn't Play with Dead Things to 5.07 The Curious Case of Dean Winchester, Dean's elephant hair bracelet is replaced with a skull prayer bead bracelet. This type of bracelet originated in Tibet and is said to assist with contemplating the meaning of life and death during meditation. 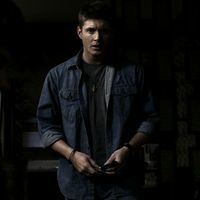 From 5.08 Changing Channels, all of Dean's jewelry has been removed; his signature silver ring and the skull prayer bead bracelet are gone and only his watch remains. See the explanation from Jensen Ackles and the removal of jewelry from season 5 onward. The first sighting of skull bracelet in 2.04 Children Shouldn't Play with Dead Things. 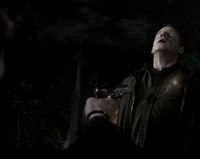 The bracelet as Dean shoots Azazel in 2.22 All Hell Breaks Loose: Part Two. Dean's Bracelet in 3.08 A Very Supernatural Christmas. Dean's Bracelet in 4.06 Yellow Fever. Dean's Bracelet in 4.01 Lazarus Rising. 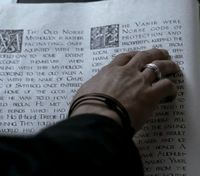 Dean's Bracelet in 4.22 Lucifer Rising. This page was last edited on 9 March 2019, at 15:12.